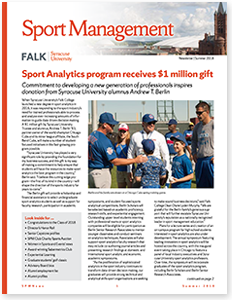 The Department of Sport Management’s yearly newsletters are a valuable informational tool for SPM students, alumni, parents and friends. Stay up-to-date on all things Sport Management with news headlines, student highlights, and upcoming events. Click on the link below to download a PDF copy of the most recent newsletter or view an accessible, text-based version of the Newsletter. For older archived copies of the Sport Management Newsletter, please contact the Sport Management office. The Department of Sport Management’s e-newsletters are a valuable tool for SPM alumni and friends to stay up-to-date on all things Sport Management. Click on the links below to view each e-newsletter.